Doing a background check on an applicant can seem like a hassle. You have to contract with a background check provider, fill out the forms, get the applicant’s permission, and then follow through with the correct notifications once the check is complete. If you decide to exclude the applicant, there are more requirements in the two-step adverse action process to comply with the Fair Credit Reporting Act. Perhaps you think it might be easier to go with your own information gathering and that it will be faster, too. You could just conduct a good interview to get to know the applicant, review the resume, look into the applicant’s social media accounts, and maybe call the last known employer. Maybe you believe your instincts are honed to recognize good character. 1. It can provide a solid defense against negligent hiring claims. Despite your best efforts, your new employee may commit a crime or cause damages against a customer, co-worker, or a partner. When that happens, your legal defense has a much better chance of showing that you exercised due diligence in hiring if you can evidence a comprehensive background check report. Findings of negligence are based on what you knew or should have known about someone. The background check helps to convert the ‘should have known’ into things you actually do know and can make decisions on. 2. 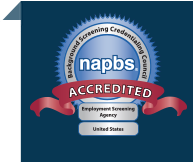 Background screening helps demonstrate your concern for workforce safety. On a day-to-day basis, your new employee is going to be interacting with other people in the workforce. Showing him or her that your workforce is composed of people who have been hired based on a similarly rigorous background check sends a message that you take the culture seriously, and that you work to maintain workplace safety. You begin to build trust before day one on the job. 3. You can show that the application process is an equal playing field. Applicants want to know that the effort they put into applying for your job is not wasted because you’ve already made a “gut check” decision by hiring someone else. It should be clear in your job description and your initial contacts with the applicant that you intend to research their qualifications for the position carefully. If you must finally exclude an applicant, the applicant will take away helpful information about his or her qualifications and also likely form a better opinion about your organization. 4. Background screening can help you avoid disparate treatment discrimination. You want to avoid discrimination based on race, religion, gender, sexual orientation, ethnicity, and age (protected categories under Federal Law). Using a standard background process designed for the position in question (based on job related criteria), you create a foundation for good hiring decisions as well as a preventative barrier to discrimination lawsuits. Employment law sets a demanding, high bar for hiring. Making decisions by gut instinct is far more likely to result in an employer either failing to hire a good fit for the job, or falling foul of legal tripwires unnecessarily.